Seven ARR Craib MSA Scottish Rally Championship (SRC) competitors will head to Fife’s Knockhill Racing Circuit next Wednesday (19th September) to contest the SRC John Horton Star Driver Award shoot-out. The Star Driver Award was first introduced last year and saw Keith Riddick come out on top of the shoot-out at Kames Motorsport Complex, allowing him to take advantage of a subsidised entry into the Down Rally this summer in his MG ZR. This year will see seven finalists – five picked after a counting round of the SRC and two wildcards – compete against each other in a series of tests in pursuit of a day’s tuition with 1999 British Rally Champion Tapio Laukkanen and African Rally Champion co-driver Drew Sturrock. Paddy Munro, Angus Lawrie, Ross Hughes and Steven Wood had all previously booked themselves a place in the shoot-out, with Galloway Hills recipient John Wink and wildcards Michael Binnie and Alasdair Currie joining the quartet to complete the line-up. 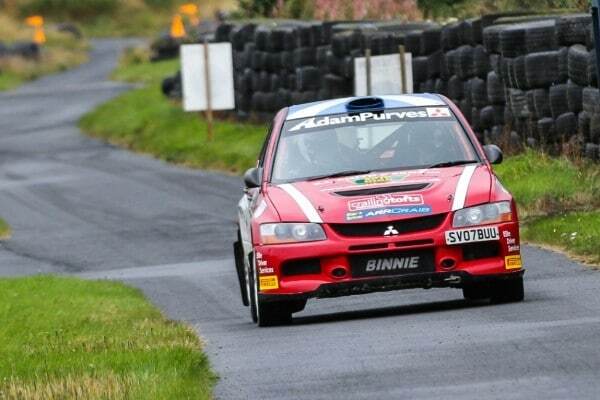 Marty Scott had received a nomination following the Speyside Stages but can’t compete due to work commitments. The shoot-out is a three-part test of the driver’s skillset. Each finalist will have an interview with a panel of judges to assess attitude and aptitude. Prestone MSA British Rally Championship Manager and Dayinsure Wales Rally GB Clerk of the Course Iain Campbell will be joined by MCR Motorsport Media’s Matt Cotton and The Sun Scotland’s Motoring Editor Jon Doran for the process. The drivers will then be joined by their co-drivers and will head out onto a specially created stage around the Rallyschool track at Knockhill to write a set of brand new pace notes from scratch. They will be joined in the car by former factory co-driver and team manager Mike Broad, as well as two-time Scottish Rally Champion Andrew Wood who will access the note making process. There will then be selected runs over the stage in the afternoon, as the judges gather together to watch the drivers in action before deliberation on their decision. SRC Chairman Gordon Adam is delighted to see the Star Driver Award return for a second year, and believes whoever comes out on top of the shoot-out will be more than deserving of the fantastic prize on offer. “The SRC John Horton Star Driver Award is something truly unique to UK rallying, so we are delighted to be holding this shoot-out for a second consecutive year,” said Adam. Angus Lawrie and Michael Binnie both contested last year’s shoot-out, but the competition will be something totally new to the other five finalists. The winner of the shoot-out will be announced on the day of the contest, with the day’s tuition taking place in October for the new Star Driver Award champion and 2018 SRC Junior Champion Niall Cowan Jr.
Outside the cockpit, John was actively involved in rallying, helping to develop the MSA British Rally Championship and its own Star Drive schemes as well as assisting in the organisation of many high profile events across the country. Perhaps though, he is most famous for his media and PR activities, being the voice of the PA system on many UK and Irish rallies down the years. He also worked as the national press officer for the British Grand Prix and Wales Rally GB at the turn of the century, and is sadly missed by the rallying community after he died suddenly in 2016.